Valerie Gernhauser is no stranger to unfortunate circumstances. The timing of her professional career landed amidst Hurricane Katrina, the financial banking crisis of 2009, and the economic downturn of the entire country. But instead of feeling self-pity for herself, she decided to do something about it and took her future into her own hands. Valerie, a law school graduate, turned to the unlikely path of wedding planning after learning the ropes while planning her own wedding celebration. She struggled for a few years with finding the right price points to charge her clients, and began to feel the burnout factor that many in the wedding industry can feel. That’s when she changed up her game plane, created a pricing strategy (which she also offers as part of an overall pricing package for planners and designers), and became a force to be reckoned with within the international wedding planning and design community. Valerie’s interview with Andy serves as an empowering call for anyone in the wedding industry who feels undervalued and underpaid for their creativity and hard work. She tells us her amazing story of how she created her pricing structure, how she inspires others to adopt her business plan and improve their self-worth, and why witnessing father-daughter dances still gets her choked up. Her full interview is available to listen to now. 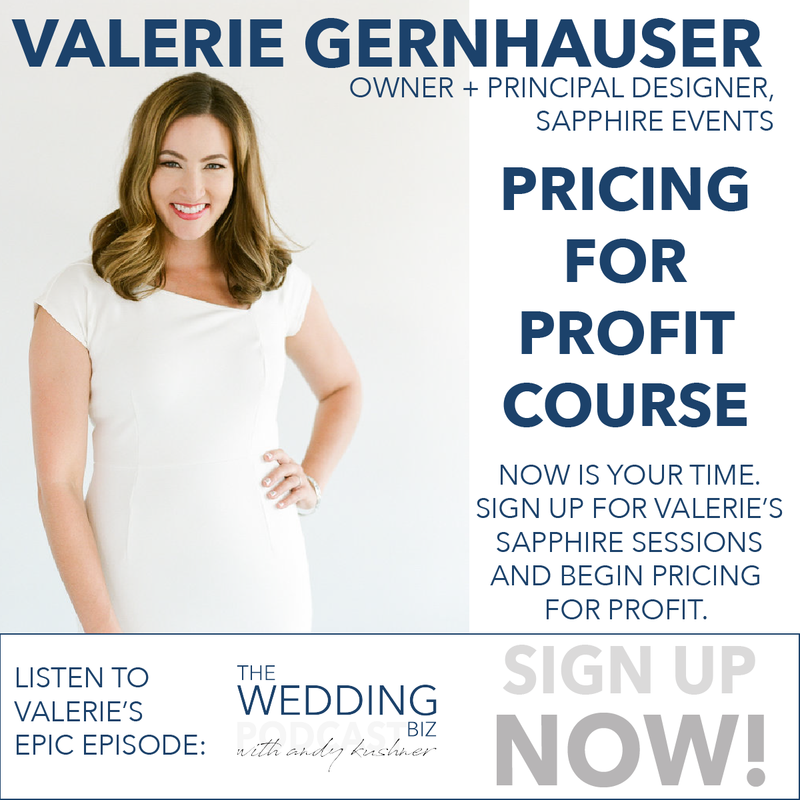 Valerie is currently offering her “Pricing For Profit Course”! Click here to learn more and get access to our special code giving listeners $250 off their registration fee!